Welcome to the almostadoctor differentialiser! 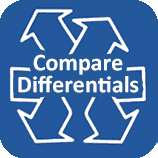 Use this interactive tool to quickly and easily compare differential diagnoses for some of the most common types of presentation. Huge thank you to Emily Garrett, a 4th year student at UCL who wrote the original content.